There is an unbelievable amount of wealth and glamour in Hollywood, but one thing that has remained scarce in the industry are wholesome families. There exist very little families like that of beloved actor and icon, Denzel Washington who has been married to his wife for over 30 years and has raised beautiful unproblematic children, all of whom have followed their father into the entertainment industry themselves in different capacities. One of them is Katia Washington. Among the quartet of Denzel Washington’s children, it is fair to say Katia Washington is one of the less popular ones seeing as she has chosen to work behind the camera instead of in front of it like the rest of her family. Still, she has built a noteworthy pedigree for herself as not just the daughter of Denzel Washington, but as a successful woman in her own right. Katia Washington was welcomed into the world by Denzel and Pauletta Washington on the 27th of November in 1987 in Los Angeles, California as the second child of the famed actor and his longtime wife. Naturally, it is believed and expected that Katia got the best education available as the daughter of wealthy parents but unfortunately, the full details of her education history are unknown. We, however, do know that she attended Yale University. Everything about the background and life of Katia Washington suggests that more than just the need for privacy as a celebrity, she is not one to court the spotlight and this has been buttressed by the fact that among her siblings, she is the only one who has chosen to work exclusively behind the camera. Katia Washington’s professional work as a behind the scenes woman began in 2012 when she secured a big opportunity to work with one of the biggest directors in Hollywood, Quentin Tarantino as an editorial production assistant for the film, Django Unchained. It was a start to her career which appears to tend towards being a film or television producer. Katia Washington got her second role behind the scenes as an assistant in The Equalizer, a 2014 movie which starred her father. She then followed it up as an assistant to Nate Parker, the director of one of the most acclaimed films in 2016, The Birth of a Nation. In the same year, she was credited as an associate producer in another of her father’s films, Fences which also starred Viola Davis. Most recently, she has been credited as a co-producer for Assassination Nation. As we mentioned in the introduction, Katia Washington hails from one of the most popular families in Hollywood. 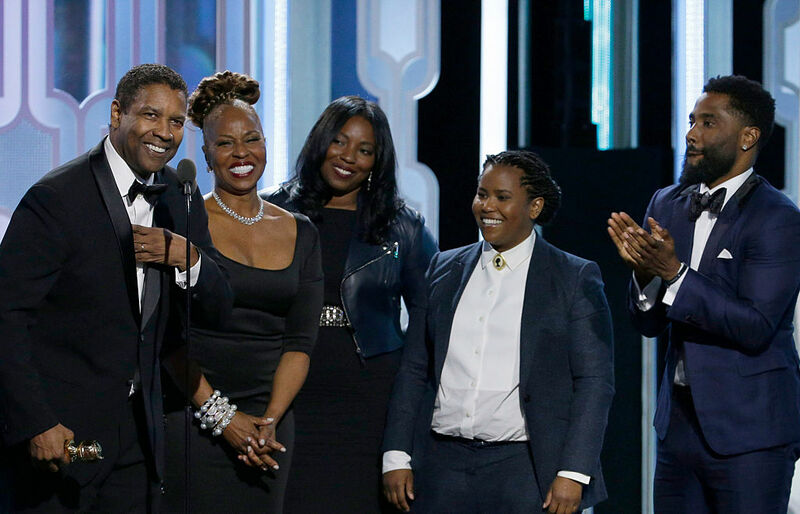 While her family is no Kardashian, the Washingtons have an iconic patriarch in the person of Denzel Washington who is one of the most respected actors working today and a man with a filmography several men and women would be proud of. Her mother, Pauletta, although not as popular as her husband is also an actress who has appeared in films like 90 Days and Beloved. Katia Washington is the second child out of four children and the only one who isn’t an actor. Her older brother, John David Washington is certainly the most popular Washington in the family after the father. He stars on the popular HBO show, Ballers alongside another heavyweight actor, Dwayne Johnson. He has appeared in a number of films since he began his professional career and his biggest film perhaps till date is BlaKkKlansman which was nominated for several major awards, including the Academy Awards. Before he was an actor, he played professional football played for St. Louis Rams and California Redwoods. Her younger siblings, sister Olivia, and Malcolm Washington are what could be described as upcoming actors. Between them, Katia Washington’s remaining siblings have played small roles in films and TV shows like Empire, Chicago P.D and Mr. Robot. The last born, Malcolm Washington is a recent graduate of film school. As we mentioned earlier, Katia Washington is one of the more private children of the Malcolm X actor and this has spurred some rumor in the zeitgeist and people seem to believe that she is gay. While she hasn’t been known to be in a public relationship, Katia Washington is a straight woman. According to reports, she has a net worth of $2 million and a height of 5 feet 4 inches.